So you figure out what splurges are important and you start paring down the rest over time. Those fun purchases become less, and you pick and choose the ones you want wisely instead of just buying and letting them pile up. Why should you do something similar with the treats you eat? For much of the same reasons. To stay within your calorie budget (AKA maintain your weight). Now if you follow the If It Fits Your Macros (IIFYM) style of eating, you’re probably rolling your eyes right now. You plan your treats, you fit them into your macros, and the world is a wonder-filled place. Absolutely! You can still lose weight and maintain your weight doing this, but that’s just one piece of the puzzle. If you keep doing it this way, you may not be doing yourself any favors. Instead you’re continuing the habits that got you here in the first place, just on a temporarily smaller scale. What about that day off in the future when you don’t want to track and fit your puzzle pieces together? If you aren’t planning and fitting, how are you going to know if those daily treats fit? Setting a treat budget now when you’re tracking and planning everything out, and working to gradually reduce your treats is a good idea to set yourself up for when the tracking or diet ends. It gives you the tools during the process to learn to cut back. Treats taste great which is why they’re fun to eat, but they also tend to be very calorie dense. That means that they are high in calories without a lot of volume. This can lead to hunger, blood sugar spikes and drops, and hangry cravings. Not a great thing if you’re dieting since these can cause you to overeat later and blow your diet when the donuts show up in the breakroom at work. They don’t have as many vitamins, minerals, fiber and good stuff to give you energy. The more treats you have, the better your chances of cravings. You may not feel as great overall as you would if your nutritional needs were being met with a wide variety of whole foods. More energy means feeling better during the day, moving more, hitting workouts harder. All of these mean more calorie burning without much thought. Treats are very easy to eat too much of. Since treats are calorie dense, they don’t leave a lot of wiggle room in calorie tracking. That muffin you eat, the meal you get at the restaurant, that container of fries… You’re at the mercy of the machine packaging it or the cook preparing it. I can pretty much guarantee that neither is going to ensure that the serving size is identical to the one on the label. 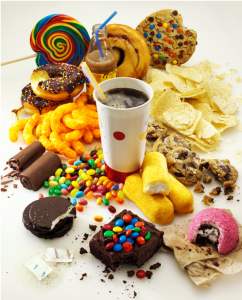 If you’re eating a lot of these kinds of foods and they pack a lot of calories, then you’re taking a chance of eating more than you think. This also adds complexity once you’re done dieting and tracking. Estimations and portions can easily get larger and treat calories can add up faster than you realize. Think about the calorie difference in eating too much of a grilled chicken salad compared to too much fries and ice cream. They keep your sweet and savory tastebuds going so other things don’t taste as satisfying. You can have a daily ice cream sundae and plan your day around that while still reaching your goals as long as your calories are in line. Think beyond that though. If you’re used to cupcakes, ice cream, fries, pizza, other things like apples, watermelon, grilled chicken, baked potatoes don’t quite taste as satisfying. You might even consider them boring and have to choke them down. By cutting back on the sweet and savory treats, your tastes gradually adjust and you start to enjoy more whole foods. Apples taste sweeter and become satisfying. You’re no longer bored with a grilled chicken breast. Also when you do have treats, they start to taste better as well and you’ll find yourself satisfied with less. You’ll be happy with a few bites of a cupcake instead of two full cupcakes, and you won’t have to white knuckle stop yourself or feel like you’re left out. Having anything less often, makes it special when you do have them as well. Your standards are higher and you wait for treats that are really worth it and you enjoy them fully when you indulge. They’re called treats for a reason. It doesn’t have to be a total elimination of treats and a 180 turn from Yummy-ville to Boring Food City. Not at all. That’s the benefit of IIFYM. You can fit fun stuff into your eating as often as you want while cutting back on them and learning how to eat in a new way. It can be a gradual process. In fact, it’s more sustainable if you do make it gradual and cut back over time. The first week or two just keep track of treats. Make a little tick mark on a piece of paper or index card and see how many you eat over the course of a week or a day even. Once you’ve gotten a good idea, pick a slightly lower number and aim for that as your goal. So if you find you have 28 treats a week, give 21 a whirl maybe. That’s one less per day. Do that for a week or so and see how it goes, then shave off a few more. You don’t even have to eliminate a treat, but consider if there are lower calorie or whole food substitutions you can drop in. For example, if you have a latte every afternoon change to black coffee one day a week. Everyone’s definition of “treat” is different so don’t feel forced into a meaning. For some, it’s going to be fast food or desserts. For others, it might be sodas and lattes or even calorie dense foods like peanut butter or protein pancakes. Don’t stress over an official meaning of treat, but figure out what treat means in your world and set your budget. Cut back or make swaps at a rate that you’re comfortable with and keeps you moving towards your goals. There’s no one standing over you, demanding that you slash your budget. Little changes here and there add up. Approach it creatively and cut back on portions as another option. Just like you do with your spending. Your wallet and your waistline will be happier in the long run. Here’s a great, lower calorie recipe for you that will tickle your sweet tooth with juicy slices of watermelon. Arranged chilled watermelon strips on a platter in a pretty pattern. Sprinkle on the crumbled feta and the mint. Salt to taste. 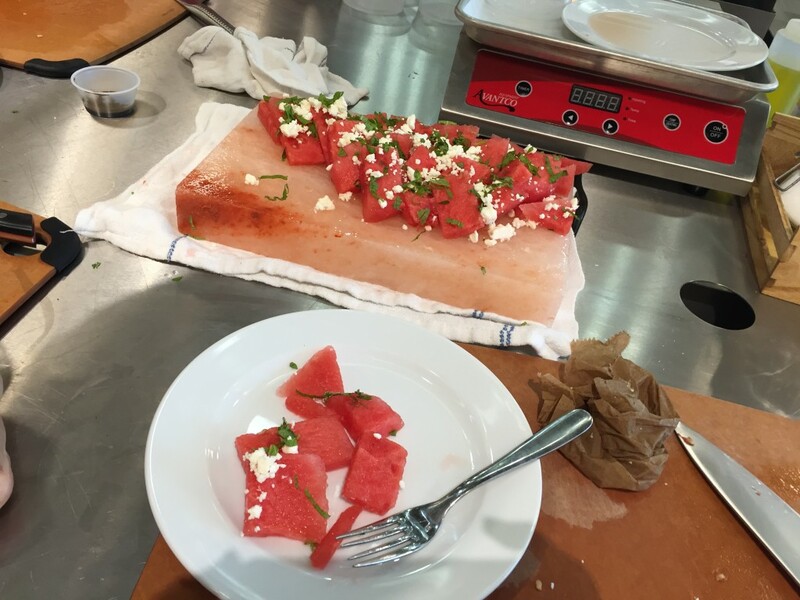 The salt from the feta and the kosher salt really brings out the sweetness of the watermelon and makes this salad fun. You can even freeze the watermelon for those really hot summer days. If you learned something, share this article with one of the share buttons below. If you’re interested in working with me to set up a treat budget while working towards your health goals, I’d love to work with you. You don’t have to and shouldn’t 100% give up foods you love. Drop me an email, or come on over to Facebook and ask a question.